New York City real estate firms are adopting two very different strategies in the face of the housing slump. While the majority of firms are closing offices to save money on overhead, others are taking advantage of cheap rents to expand their market share. Placing itself firmly in the latter camp, Halstead Property has recently added two new real estate offices to its roster. In October, the company opened its first out-of-state office at 79 Hudson Street in Hoboken, while a new Boerum Hill, Brooklyn, branch is slated to open at 495 Atlantic Avenue April 1, as The Real Deal first reported in August. She said the company’s ability to expand, despite the real estate downturn, is due largely to the support of parent company Terra Holdings, whose principals are Kent Swig, David Burris, and Arthur and William Zeckendorf. 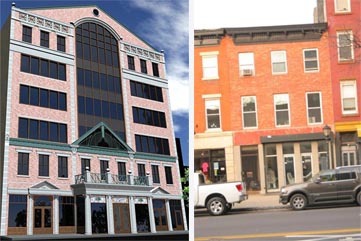 The idea for the Hoboken office, located in a pedestrian-friendly storefront between Hudson Place and Newark Street, came about after Halstead was asked to consult on several New Jersey new development projects, she said, including A Condominiums at 389 Washington Street in Hoboken. The company quickly noticed an opportunity to build long-term brand loyalty, since customers who move to New Jersey’s so-called “Gold Coast” often return to Manhattan. Once Halstead was licensed to operate outside New York, it set about hiring and training agents from New Jersey. There are currently nine salespeople in the Hoboken office, Ramirez said, though the storefront space has room for 12 and may eventually grow to that number. The Boerum Hill office, located between Third Avenue and Nevins Street on “Antique Row,” will house six agents at first. The new location, which will have backyard space for company functions, was first announced in August, Ramirez said, and plans have proceeded despite the ensuing economic downturn. “We don’t just make these decisions in a split second, and we also don’t turn around on a dime,” she said. In recent months, many real estate firms in New York — including the Corcoran Group, Citi Habitats, Bellmarc Realty and Warburg Realty — have closed offices to cut costs in the current market. Meanwhile, firms like Halstead and Prudential Douglas Elliman, which recently announced a new Fort Greene office, are doing the opposite. Both strategies have benefits, according to Kathy Braddock, a principal at the real estate consultancy braddock + purcell and co-founder of the New York branch of Charles Rutenberg Realty. Because sales are happening less frequently, “it’s taking much longer to bring in any dollars,” she said. “If you can get rid of space, then you’re really a step ahead.” Besides, she added, technology allows people to work virtually, lessening the need for office space. On the other hand, opening new locations in the current climate has certain advantages. For one thing, companies may be able to get cheap office space amid higher vacancies, Braddock said. Storefront space, in particular, can help build brand recognition in new markets. Still, opening a new location in the midst of the current downturn is “rolling the dice,” she said.